Why ban local authorities from running bus services? Britain's House of Lords is debating a bill which will ban local authorites from running bus services, despite council-run buses being very successful. Across the country, people rely on buses. In England alone there are over 4.5 billion journeys made on buses each year. Buses might seem like part of the furniture and don’t get much attention – but they are vital. Next week the House of Lords will be debating a new Bus Services Bill. This Bill is aimed at reversing the decades of decline in passenger numbers, as passenger numbers have decreased steadily everywhere apart from London. Whilst much will be made of the parts of the Bill that give mayors franchising powers, less is being heard about the clause that aims to ban any more local authorities from running bus companies. In one go, this small clause – clause 21 – robs communities in England of opportunities to access high quality, low cost bus travel, which evidence suggests authorities are well placed to provide. It is unnecessarily ideological and partisan, and needs to be dropped. This isn’t to suggest that bus services should all be provided by councils. Start-up costs and other factors might make it infeasible, but, at the same time, they shouldn’t be banned from exploring the option. Many councils are able to run effective services and maintain high levels of investment, improving passenger satisfaction and comfort, whilst supporting environmental goals and keeping fares down. If the conditions are right, other councils should be allowed to consider this as an option when designing bus services. We Own It is campaigning to have Clause 21 dropped from the Bill. In the UK, there are 12 local authorities providing bus services. These vary in size and scope, from a small service in rural Dumfries and Galloway focusing on school and social services, to large scale operations in large cities including Edinburgh, Nottingham and Reading. As well as this, it’s worth noting that local authority bus operators perform well when it comes to the environment. Again, the awards are indicative. In the 6 years that the environmental award at the UK Bus Awards has been running, local authority providers have received gold awards twice (Nottingham 2015, Lothian 2013), silver awards three times (Nottingham 2014, Reading 2012 and 2013), and bronze once (Reading 2015). A few examples from across the UK help to demonstrate the success stories of local authority bus companies. Lothian is consistently one of the best performing bus operators, with a strong record of investment, and increasing passenger numbers. Recently, they won Bus Operator of the Year at the Scottish Transport Awards. They also won Bus Service of the Year, increasing passenger numbers by 50% on route 113. The Bus Services Bill aims to improve passenger numbers – proving local authorities can do this. Lothian also won gold in the Environment category in 2013 at the national awards for their investment in diesel-electric hybrid buses and retrofitting busses with ultra-low emission exhausts. Lothian continue to invest in cleaner, better transport, and boast one of the youngest, most environmentally friendly fleets in the country. Nottingham is a real success story. As well as boasting one of the highest passenger journeys per head outside London, they have been awarded Bus Operator of the Year award in 2012 and 2014. Prior to this they won gold in the environment category at the Bus Awards thanks to the Electric Bus Partnership. 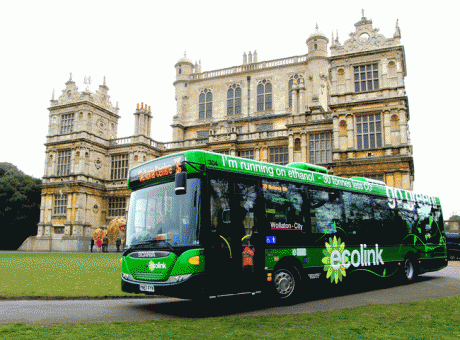 This has led to forty-five fully electric buses being used by partners Trentbarton and Nottingham Community Transport. Thirteen more will be running by September 2016, bringing the total electric fleet to 58 vehicles – reportedly the largest fleet of electric buses in Europe. This demonstrates that some of the arguments about local authorities being unable to achieve growth, innovation or investment are misplaced. And the fact that they work closely with the council enables some of the joined up thinking necessary for quality bus services. Much of this is made possible by increased investment. Reading Buses have been able an additional £3 million a year in the bus network (around 12-15% of its annual turnover) because it doesn't pay out dividends to private shareholders. The extra money means better quality buses, and is one reason why more people take the bus in Reading. Reading Buses are also able to maintain services on Sundays and in the evenings, when commercial operators are less likely to provide due to the lower margins. All of this suggests that Clause 21 of the Bus Services Bill goes too far. If the government are really intent on improving bus passenger numbers and improving services, other areas should be able to follow in the footsteps of some of the best operators out there. At the very least, all options should be on the table. And that includes local authorities providing bus services through arms-length companies. This can reduce costs, improve passenger satisfaction, and often helps reach environmental goals. Moreover, it can help to ensure joined up service delivery and maintenance of services in the evenings and on Sundays, services which might fail profitability tests in the eyes of other providers. Whilst some of these issues can be avoided with good franchising, enabling local authorities would offer even more benefit for passengers and this option needs to be open to authorities, particularly if other services are failing to deliver on cost, investment, reliability, or other indicators. These companies are often much more likely to be able to do the necessary joined up thinking that can create and maintain comprehensive service delivery, easy to understand fares across an area. Join We Own It to campaign against Clause 21.